← Hello – Welcome to My New Blog! One of our friends is Randy Pierce, a man who is exceptional in many ways. His current past-time is hiking the White Mountains of New Hampshire. His goal is to climb all 48. Did I mention he’s blind and does this with the assistance of a remarkable guide dog? Oh yes, the coolness is humbling, and if you got to meet him you would be even more impressed. New England Patriots Fan of the Year in 2001, a black belt, an accomplished hiker, and totally blind. And to top it off he has established a charity to use his hiking experience to raise money and awareness for the visually impaired, as well as inspiring others to achieve the best. 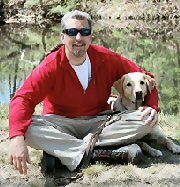 Donations go to help New Hampshire Association for the Blind and Guiding Eyes for the Blind. This is my friend and fraternity brother, Randy Pierce. He's blind. But that didn't stop me from talking him into running a Tough Mudder for Oberto Beef Jerky today. One of the most inspirational things I've ever been part of. 2020 Vision Quest is a non-profit organization founded by Randy Pierce of Nashua, New Hampshire. Pierce is a totally blind man who plans to earn certification from the Appalachian Mountain Club (AMC) for climbing all 48 of the state’s mountains over 4000 feet tall, by the year 2020. Pierce is led on the trail by his guide dog Quinn, a yellow Labrador retriever, also called “The Mighty Quinn” by Pierce in appreciation of the dog’s remarkable prowess at mountaineering. to raise funds to support two charities that serve the visually-impaired. These charities are the New Hampshire Association for the Blind, which provides vision rehabilitation services, and Guiding Eyes for the Blind, an organization that trains guide dogs and matches them with owners at no charge. 2020 Vision Quest was formed in the spring of 2010, and performs all of its fundraising through the New Hampshire Association for the Blind. Contributions to NHAB – 2020 Vision Quest are tax-deductible for donors, given that the NHAB is organized as a 501(c)(3) public charity. Randy Pierce was born in Nashua, New Hampshire in 1966, and graduated from the University of New Hampshire in 1988 with a degree in electrical engineering. A year after graduation, it was discovered that his vision was compromised. Within a matter of weeks, he had lost total vision in his right eye, and retained just a small area of tunnel vision in his left eye. The cause of the blindness was a mystery to physicians, though they believed it to be a degradation of neural functioning. Pierce’s vision would continue to degrade until he slipped into total blindness in the year 2000. Pierce purchased season tickets to the New England Patriots NFL team in 1988, and despite his disabilities, would attend every home game from that time on, missing only a single game. An avid fan of the Patriots and in particular their affable linebacker Tedy Bruschi, Pierce would be named Patriots “Fan of the Year” during the 2001 season, in which they won Super Bowl XXXVI, the first of their three championships of the era. He was also one of two fans selected by the NFL and the Pro Football Hall of Fame to represent their teams at the game in Visa’s Hall of Fans. Pierce and the Fans of the Year from the 30 other NFL teams from that year are enshrined in an exhibit at the Hall of Fame. Pierce also returned to karate training in 2000, and would earn the rank of 1st degree Black Belt in 2002. In 2003, Pierce had another major setback. The disease that had destroyed his visual functions was now affecting his cerebellum, causing him to feel a constant sense of spinning and disconnection from the ground. He now uses a wheelchair. He suffered crippling migraines, and his vertigo was so severe that he was often unable to engage in conversation. Then, a few months later, his first guide dog—Ostend, a six-year-old golden retriever that had accompanied him to the Super Bowl and most of the Patriots’ home games—died unexpectedly of heart cancer. Pierce was determined to overcome this new challenge, and undertook a series of experimental medical treatments to remap his brain functions, which returned some degree of balance. Despite a constant sensation of spinning, he began walking on crutches, and then graduated to a walking stick. By 2006, he had recovered his ability to walk, and traveled to New York where he was matched with a new guide dog at Guiding Eyes for the Blind. Quinn would become his new partner. In the spring of 2010, Pierce and a number of people from his wide circle of friends began work on 2020 Vision Quest. He and Quinn prepared for the challenge with a grueling six-day trek through the Pemigewasset Wilderness with a UNH hiking team. Randy and Team 2020 then held a practice climb on the Welch-Dickey loop, which summits Mt. Welch and Dickey, on May 1, where he proposed marriage to Tracy. They were married October 10, 2010. The first official 2020 Vision Quest hike took place on July 4 and 5. Pierce, Quinn and his hiking team reached the summit of Mount Monroe — at 5,372 feet (1,637 m) the fourth highest of the 48—around 5 pm on July 4. The team stayed at the AMC hut at the Lakes of the Clouds, and on the morning of July 5 began their ascent of Mount Washington, the highest peak in the northeastern United States at 6,288 feet (1,917 m). They reached the summit shortly after 11 am. Due to the reduced pace of their climb, the team was unable to descend the mountain safely during daylight hours; they rode down the using cars and the Cog Railway. This failed to meet AMC’s requirement that the hiker ascend and descend the mountain on the same trip; for that reason, Team 2020 plans another climb of Mts. Washington, Monroe and Eisenhower in the future. Three weeks later, on the weekend of July 24–25, Randy and Team 2020 successfully climbed and descended Mount Hale in Grafton County, New Hampshire. Other hikes planned in 2010 are Mt. Tom, Mt. Field and Mt. Liberty.